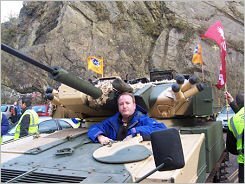 Home › Telford News › When did Mark Pritchard stop being a Conservative? When did Mark Pritchard stop being a Conservative? Did Mark Pritchard leave his party or has his party left him? It’s a question we’ve asked ourselves many times and we suspect it’s one that he’s asking himself on a daily basis. Although he still sits as a Conservative MP, Mark Pritchard has been in pretty much constant conflict with his party for the last couple of years. He disagrees with them on “Europe” (he means the EU but like most Tories he doesn’t seem to know the difference), immigration, animal welfare, social mobility, religious rights and now he disagrees with them on taking in Syrian refugees. UKIP leader, Nigel Farage, told the BBC today that in his view the UK should accept some Syrian refugees, pointing out that even though UKIP opposes mass immigration, there is a big difference between immigrants who want to move here for economic reasons and refugees whose lives are in danger if they stay at home. The Tories and Lib Dems don’t want to accept any refugees whilst Labour wants to take between 400 and 500. Clearly we can’t take all the refugees but we should play our part as an open-hearted, compassionate country. There’s real suffering and we need to do our bit along with the rest of the international community. In some respects Mark Pritchard demonstrates UKIP values such as personal responsibility and freedom, discomfort with mass immigration and an apparent opposition to our membership of the EU but then he continues to support a political party that supports unlimited immigration, hates the idea of social mobility, refused to support the right of Christians to wear their cross in the workplace, funnelled taxpayers’ cash to militants believed to be responsible for the persecution of Christians in Syria, loves the EU and thinks that chucking over half a billion pounds of aid at Syria will keep Syrian refugees safe. Then there are his ill-informed , disparaging comments about the local food bank here in Telford and his morally dubious second and third jobs that are either earning him thousands of pounds an hour or are eating into the time he should be working as an MP. While Mark Pritchard does have some decent qualities such as disliking David Cameron and disagreeing with most key Tory policies, we certainly won’t be entering into an electoral pact with him at the next election and if he ever did decide to switch allegiances to UKIP (he’s been the odds on favourite to do so for the last couple of years) then he’d have to work very hard to convince us that he’s worthy of our support. 1 Pings/Trackbacks for "When did Mark Pritchard stop being a Conservative?"